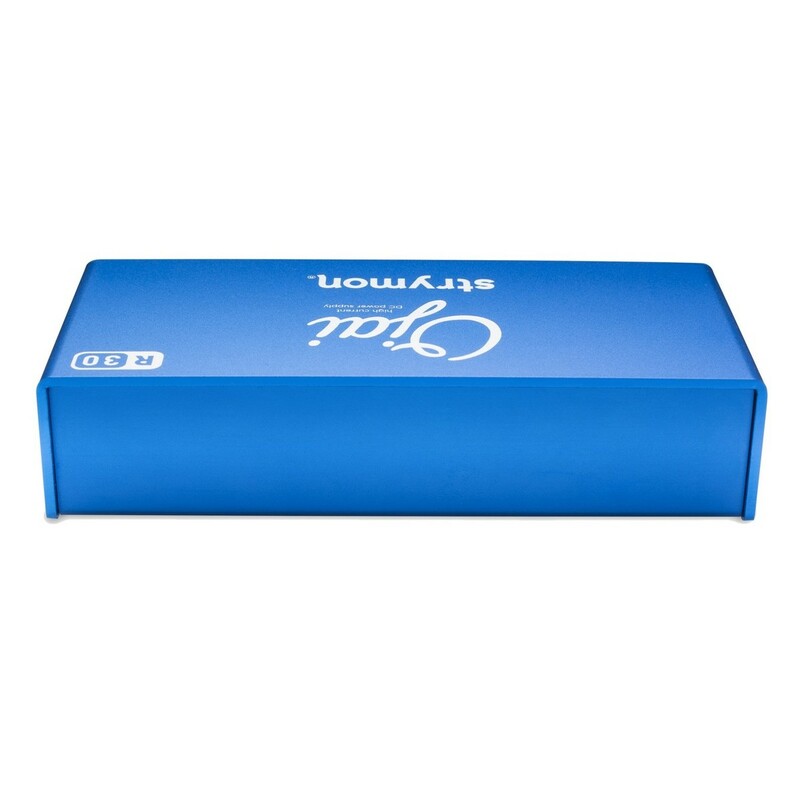 The Strymon Ojai R30 Power Expansion Kit is a professional-grade power distributor for up to 5 FX pedals. It accepts power from another Strymon powered product or Strymon power supply (not included). The Ojai R30 is designed to be an expansion to another Ojai/Zuma unit, but can also operate as an independent power supply for 5 pedals (when used with an external power supply). The Ojai R30 features dual isolated outputs and power regulation for stable and noise-free operation. The 5 outputs can support high current-draw pedals - up to 500mA, with 1 output configurable to 9/12/18 volts. If you're worried about running out of outputs, the Ojai R30 is an expandable system with a 24V thru to connect another Strymon Ojai (not included) and increase your number of pedal outputs. This is a rugged and compact unit designed to fit under almost any pedalboard rig and deliver professional-quality clean power with no-fuss. It includes all the input/output cables you'll need to get connected. 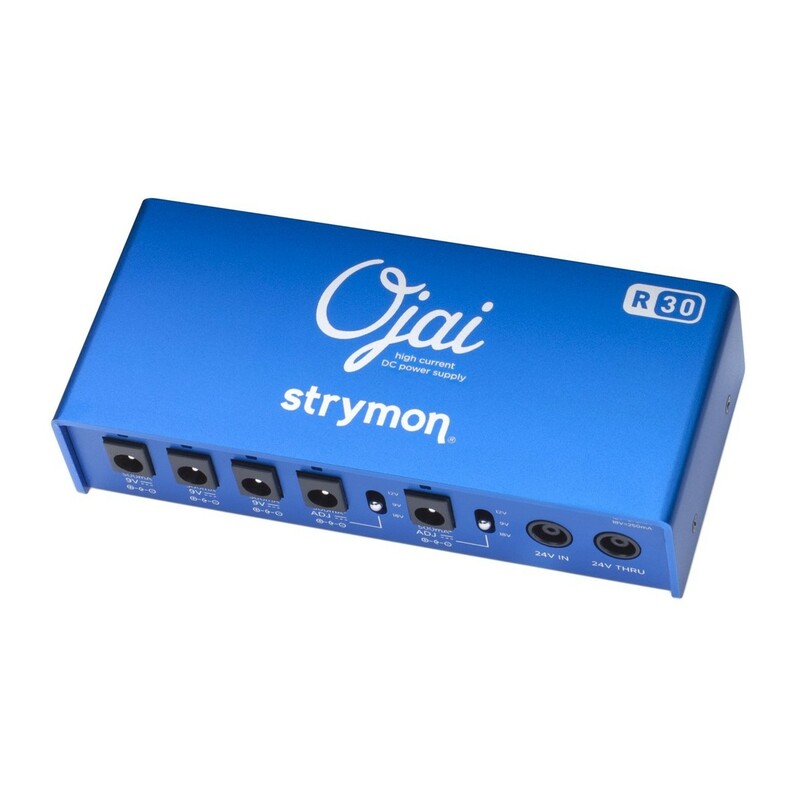 The Strymon Ojai R30 Power Expansion Kit lets you power 5 effects pedals. This unit can accept an independent power supply input (not included) to act like a traditional pedal power supply, or it can be powered by another Strymon Zuma/Ojai unit to act as an output expander. Each pedal output supplies up to 500mA which is enough to power almost any pedal, including Strymon's range of high current-draw effects pedals. One output is switchable between 9/12/18 volts, giving the flexibility to power high voltage drive pedals for increased headroom. All the necessary cables - 5x 18'' length 2.1mm barrel connectors - are supplied to power your pedals. 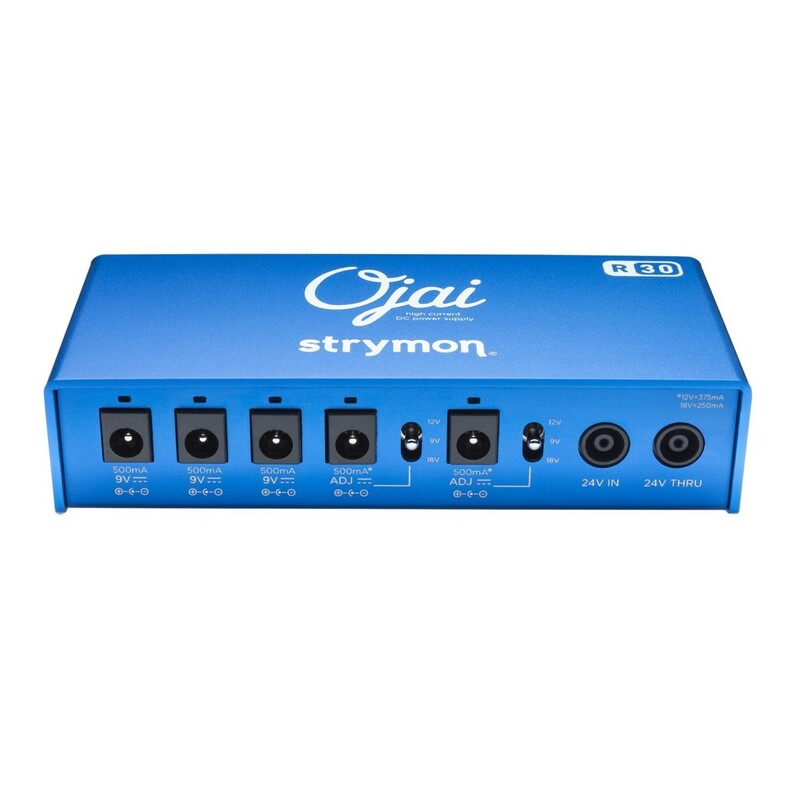 The Strymon Ojai R30 is a high quality anodised aluminium unit built to last the rigours of touring. It is thin enough to fit under almost any pedalboard, and has a switch-mode power adapter that will work anywhere in the world with the correct IEC cable and power adapter (not included). The Ojai R30 is energy efficient and has a very compact design, giving you a no-fuss approach to achieving pro-quality clean power. Each output of the Ojai R30 is dual buffered; the outputs are isolated both from each other and from the external AC input power. The power supply is also regulated both on the output and the input, ensuring solid output under changing load conditions. These features give the Zuma R300 a thoroughly professional operation with low noise and stable power for your delicate FX pedals. 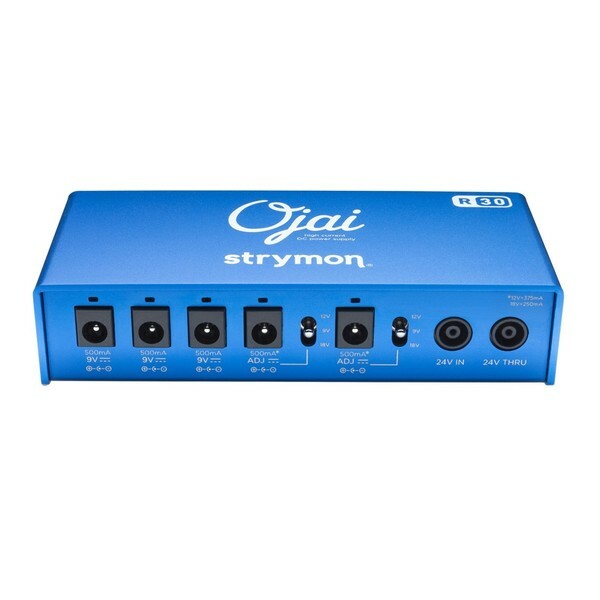 The Ojai R30 includes a 24V input and thru output, allowing you to connect another Strymon Ojai (not included) to expand your system even further. The Ojai can be powered with an independent power supply (not included), or with another Zuma/Ojai unit to act as an expansion system. This removes the worry that one power supply will limit your number of available pedals should you wish to expand your pedal rig. Overall, the Ojai R30 is a thoughtfully designed and meticulously crafted pedal power distributor, ready to get mounted on your pedalboard and, with zero fuss, give you a thoroughly professional solution to powering your rig. Accessories: 5 pedal cables included, all 2.1mm x 5.2mm barrel connectors, right angle jack, 18'' length.